Norman Wooland, Tilda Thamar, Wayne Morris et al. U.S. Army major Tom Brent is assigned to a secret Anglo-American army base in Europe to assist in the investigation of a security leak. Col. Mark Cleaver, a British officer who met Tom during World War II, is in charge of security for the combined armies of fourteen nations and has specifically requested Tom for the assignment, but is unaware that Tom has been suffering momentary blackouts resulting from injuries incurred during the Korean War. At the base, Mark shows Tom a maximum security room with a walk-in safe containing many documents, including a top secret master plan. Later, Tom meets the base's commanding officer, Gen. Goulding, his French wife Yvonne and her social secretary Helen, who is also Mark's girl friend. Tom, who had experienced a blackout during his flight to Europe, has another while talking with Helen and asks her not to mention it to Mark. Because Mark beieves that the leaks are coming from within the organization, Tom studies the dossiers of various people associated with the base and becomes suspicious of Mark's secretary, Miss Gray. When Mark leaves on a trip with the general, Tom arranges to meet Helen for lunch, but while waiting for her at the restaurant's bar, he has a blackout and is helped outside by a disreputable character named Otto. Otto takes Tom to a doctor who administers a hypnotic drug that puts him under the control of the foreign agents seeking the master plan. When Tom recovers, he thinks he has been treated in a clinic and returns to his office, unaware that anything untoward has happened. When Mark returns, Miss Gray tells him that she thinks Tom is ill as she has overhead a strange phone conversation between him and someone called "Chief." Although Mark defends Tom, Miss Gray adds that she believes Tom has been photographing secret papers. At night, Mark hides in the security room and sees Tom respond to a phone call from the "Chief" by photographing the master plan with a miniature camera. Mark surprises Tom and demands an explanation, but Tom is in a trance and states that he is obeying orders. Upon realizing Tom's trance-like state, Mark assumes the role of a commanding officer and orders Tom to make his report, but Tom cannot remember anything about his recent activities. When Goulding comes in unexpectedly, Mark covers for Tom by telling the general that Tom has been in a car accident and has suffered a concussion. Goulding then summons a doctor and leaves, allowing Mark to resume his interrogation. Tom tricks Mark however, and after locking him out of the secure room, receives another phone call from the chief. After removing the microfilm from the camera, Tom places it in a cigarette lighter that he leaves on Mark's desk. A technician helps Mark to break into the room just as Tom, ordered by the chief to open the curtains, is shot by a man with a rifle. When Tom is taken to a hospital in critical condition, Johnny Orwell, an army public relations man, issues a statement claiming that Tom accidentally shot himself. Mark informs Goulding that he suspects Tom was drugged, hypnotized and then shot because he had completed his assignment. Later, Mark notices that the film is missing from the camera and discovers it in the lighter. Mark then leaves the lighter in clear sight and waits to see who picks it up. Yvonne and Orwell become suspects when they both handle the lighter. Helen then visits Mark and, when his back is turned, substitutes an identical lighter for the one on the desk, unaware that the original lighter does not work. Mark discovers her guilt when the substitute lighter ignites. After Mark informs her that he has removed the microfilm, he offers to refrain from arresting her if she will sign a confession and identify the other members of her espionage organization. Knowing that the organization will have her killed for betraying them, Helen chooses to be arrested. 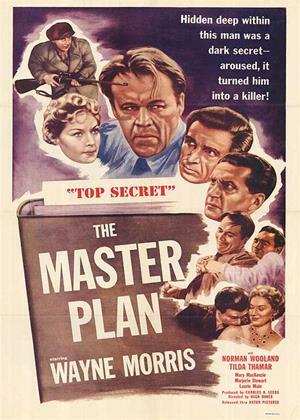 Mark then tells Helen that the master plan document was simply a decoy designed to trap the traitor.